Chris Roberts' Star Citizen Kickstarter has raised over $8 million, and fans continue to jump in, despite the game being over a year away from release. 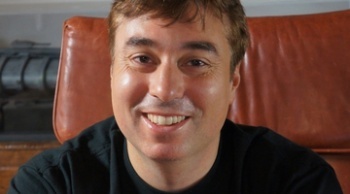 "I can make the same game for a fifth of the revenue [of a AAA title], a fifth of the sales, and I can be more profitable, and I can exist on lower unit sales," says Chris Roberts, speaking to gamesindustry.biz about the huge merits that Kickstarter offers developers. His own Star Citizen project has raised over $8 million in in its Kickstarter campaign, and shows no sign of stopping, with fans continuing to contribute despite the game's release being over a year away. Roberts also spoke about the future of Star Citizen, and possible plans to bring the current PC-exclusive to Sony's PS4. Roberts is incredibly impressed with the Kickstarter model, claiming that almost 96% of every dollar pledged goes directly to the developers, compared to the old model, which sat at around 20 cents of every dollar. "I definitely think crowdfunding is going to be part of gaming going forward. I really like what it's doing," says Roberts, explaining that while the big budget blockbusters aren't going to go away, Kickstarter will bring more power to the middle ground of "niche" developers. He says that in the past, projects like his own would be scoffed at by the big-name publishers for "only" moving around a million units. "I think that [Kickstater is] good for gamers, because crowdfunding and digital distribution are enabling more nichey stuff to be viable. It's also allowing gamers to have their voice heard, and have their influence earlier in the process. You don't really have your input into how Call of Duty's being made." Roberts also talked about the impact being a crowdfunded project has on the actual development team. "Unlike with a publisher, you can't pull the wool over their eyes because it's the real people who are going to be playing it," he said. Roberts is pleased with the affect that this open nature has on his team, telling us that he has "noticed the energy and the motivation on my team, because we're building in a very open format and we're sharing." Star Citizen is currently set to be a PC-exclusive space-sim, but Roberts is not completely closed to the idea of it coming to consoles. "The good news is that [the PS4 is] essentially a PC, so that means PC owners will get much better ports of console games. I'm not a PC elitist by any means; if I could be on the PS4, and they were open, and I could do the updating and all the sort of stuff we're trying to do on Star Citizen, then I would definitely consider putting it on PS4." The bad news? Roberts highly doubts that the PS4 will sell for less than $400. Roberts previously predicted that consoles would lose their price and power advantage to PCs in the upcoming console generation. You can pledge to Star Citizen development on its official website.